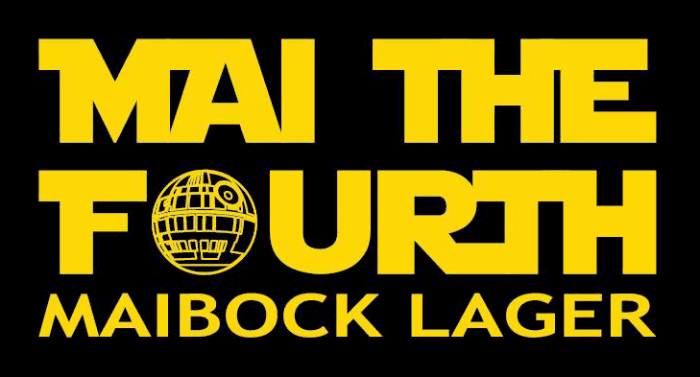 (Denver, CO) — Wit’s End Brewing Co. will release their fourth annual Maibock lager, Mai The Fourth, brewed specially for (the universally recognized) Star Wars Day on Friday, May 4th. Mai The Fourth, a traditional German-style lager, is brewed to highlight malt characters without too much sweetness, uses German hops to help balance it out, and was fermented with Bavarian lager yeast to produce clean, malty flavors with a touch of fruity grape notes. Mai the Fourth will be released on draft and in Crowlers at the StrangeWit tasting room on Friday, May 4 at 12pm, with food from My Angel’s Fine Cuisine and limited edition Mai The Fourth t-shirts for purchase. At the dawn of the fourth wave of craft beer (in 2011), Scott Witsoe opened Wit’s End Brewing Company and hasn’t looked back since. Through the years Wit’s End has added some hardware on the walls including GABF® and World Beer Cup® awards, and forged a new partnership with Strange Craft that exists in the form of a co-tasting room and brewhouse near its original location in Denver’s Valverde neighborhood. Now brewed by Head Brewer Tyler Bies, Wit’s End flagship beers, such as Jean Claude Van Blonde and Green Man Ale, are available on draft at Strange Craft’s tasting room at 1330 Zuni St Unit M, Denver, CO 80204. Find the brewery online at witsendbrewing.com.